We have an outdoor sculpture exhibit at the farm every fall . . . I know you are about to move into the monastery, but just thought I’d ask if you had a piece you might install here. You can see the prior year’s work at oldfrogpondfarm.com under the tab for art. Loved your stormy Instagram post! Scrap posts on Instagram almost every day. Some posts become images she includes in large photographic collages of people and place—magnificent landscapes with hundreds of photographic moments in which we immerse ourselves and journey through. Scrap’s visual language is quick-moving and incantatory. It is like listening to a medieval chant where the polyphony of different voices weaves a tapestry of individual melodies as well as harmonizing together. We engage with the leaps and turnings as questions about the nature of reality and meanings seep into our consciousness. She recently installed an exhibit of these photo collages at the John Davis Gallery in Hudson, New York. Scrap is also a sculptor. Inside the large U-haul truck were four identical heavy metal objects, fabricated initially for an installation on Randall’s Island, New York City. On Scrap’s website she explains Awakening Asylum was designed to commemorate both the General Slocum Steamship disaster (June 15, 1904) and Randall’s Island, an “Asylum” in the past for inebriates and the mentally ill. 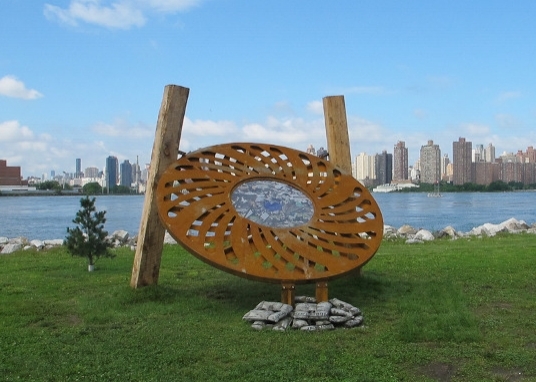 The location of the sculpture commemorated the ship’s Hell Gate waterway passage where it is thought that the steamship fire likely began. Due to faulty unregulated flotation devices and poor crew response times, over a thousand people perished in the Northern East River on their way to a Lutheran picnic excursion on the sound in Queens. This installation has castings of flotation devices, wood beams suggestive of the old ship, and a collage in the center of the spiraling metal: it is complex and multi-layered. Scrap would be bringing to the farm only the fabricated metal now in four pieces. Sculptors often take apart old sculpture and reuse its materials. I like to re-purpose parts from sculptures in storage, drawn to pieces that I may not have finished my conversation with. Scrap had sent me photos of these four large elements early on. They made me think 'wings' or 'fins'. Though I had no idea what she would do with them, I trusted in the integrity of her artistic vision. 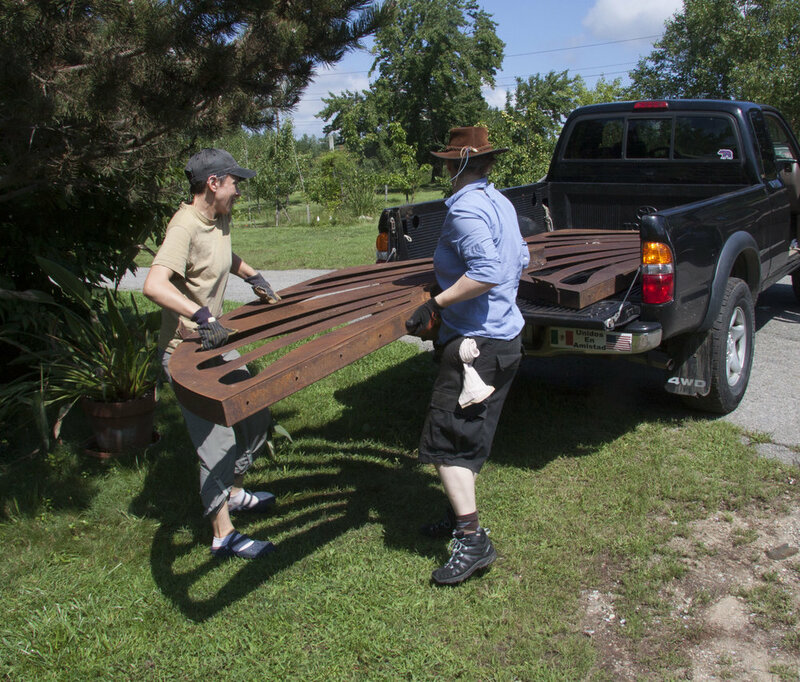 On Wednesday morning, Scrap and Jo unloaded the U-Haul, loaded Blase's pick-up, and we drove around the pond to their site. That’s where I left them—with a digging bar and shovels, on a hot day. They worked till the Japanese bells sounded for lunch. Dirty, hot, and with two ‘wings’ installed, they went back to work with Holly Ciganiewicz, one of our farmers, and completed the installation just before five o’clock, when we planned to take a swim in Bear Hill Pond. The working title is Ground Space. These four forms, dug deep into the earth, each rise like a whale’s dorsal fin and transform the space. When you walk among them, around them, or stand in the center, a curious energy also rises and surrounds you, as if walking in a biosphere. But I won’t say anymore. You have to experience it for yourself. Scrap Wrenn is one of the thirty-seven artists whose work will be on exhibit at the farm for our annual outdoor sculpture walk. Around the Pond and through the Woods opens on Friday, September 7 and will be open to the public on Fridays, Saturdays, and Sundays, 11—5 pm through October 7. If those times don't work for you, we can make other arrangements for your visit. For information about the exhibit and other fall events at the farm check out our website. I’m excited to share this year’s exhibit with you.